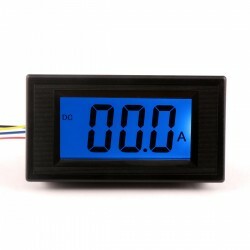 It is a USB Voltage Current Meter,Measuring range: DC 3V-8V, current :0-3A (accuracy: ±1%), Maximum .. It is a USB Volt Amp Power Monitor,Measure Range: U = 3 ~ 7.5V I = 0 ~ 2.5A,Accuracy: voltage < ±1% .. It is a 5in1 USB Tester, Input Voltage: DC 3 ~25V, Voltage Range Measuring: 4~25V, Current Range Mea.. It is a USB Power Meter Tester,Rated voltage : U = 4-7V ( self-powered ),Rated current : Current 0-2.. It is a USB Voltage Current Meter/USB Tester/USB Charger, Measuring current range: 0 ~ 3A, Measurin.. It is a Waterproof Digital Clock DC 12V 24V LED Alarm Meter, Supply voltage: 4.5 ~ 30V (wide range i.. It is a 2in1 Volt Amp Panel Meter, Measure Voltage Range DC 4.5-30V,Measure Current Range 0-100A for.. It is a 2in1 Volt Amp Panel Meter, Measure Voltage Range DC 0-300V,Measure Current Range 0-50A forwa.. Product Features: Thicken copper crocodile clip + thicken protective insulation sleeve Rated cur.. Product Introduction: VAT series is a multi-function meter based on 2.4G wireless data transmis..
Technical Parameters: Model: WLS-PVA200 Current measuring range: 200A Current resolution: 0.1A ..